Pompom Summer–A must-have collection. – Love.Yarn.Shop. Never mind the nine patterns for tops, all of which make me weep for more time to knit, what about the cotton clothesline bag, Hollis, designed by Vermonter Lynn Brennan, made with size 19 needles and a Q crochet hook? You do have to seam together the individual pieces, but how long can that take when you’re using clothesline? If you’re not familiar with Pompom, I recommend checking out this issue. You aren’t going to find a better collection of summer patterns. 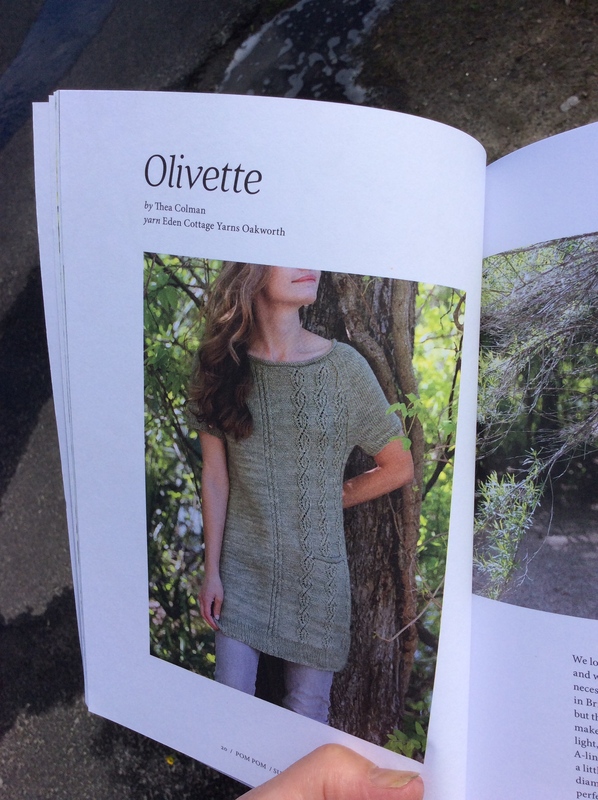 I immediately honed in on the tunic pattern Olivette by Thea Colman. The asymmetrical lace panel and little pocket stole my heart. Plus, tunics are perfect for the changeable weather we’ve been having…leggings to pull on and off as the temperature fluctuates from hour to hour, day to day. Each top in this issue has some sweet detail to attract the knitter. Trailbreeze by Courtney Cederholm has a handkerchief hem that is knit first, with some stitches put on waste yarn, which are used later to knit the body. Red Bud Isle, also by Courtney, is a “wrapped” tank, once again tempting the knitter with its clever design. I could walk you through each pattern, extolling the virtues of it, but then I wouldn’t be knitting, and if I’m not knitting, I’m “downright grumpy,” as Kiyomi Burgin says on the contributors’ page of this issue. You’ll just have to get your own copy.